Within walking distance of Height Top and open all year round. 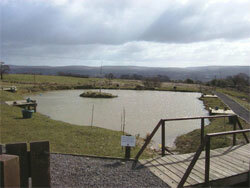 This fishery boasts 3 lakes, The Hallows, The Broomstick and The Cauldron, ranging in size, with disabled access. Opened in 2007, The Rising is aimed at families and juniors who enjoy a good day's fishing in attractive surroundings. All the lakes are well stocked with a variety of fish including Carp to 15lb, Tench to 5lb, Barbel to 3lb, Bream to 4lb and Perch to over 3lb. There are also Roach/Rudd, Golden Orfe, Crucian Carp and Gudgeon making up a splendid variety. Pendle View is one of the North West's Premier Venues for Big Carp, Excellent Coarse Fishing and Quality Trout Fishing. With Carp to over 51lb and a range of other specimens to go at including Pike, Perch & Bream, Pendle View has something for everyone. Pendle View is situated in the heart of the Ribble Valley in picturesque countryside and is only a stones throw from the Motorway, Preston and the surrounding area. 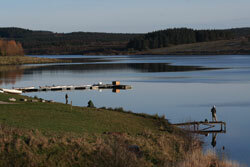 Stocks Reservoir is the largest fishery in the North West of England. Situated at the head of the Hodder Valley in the Forest of Bowland Area of Outstanding Natural Beauty, Stocks has a wild and unspoiled quality, the perfect place for a days fly fishing. Full and half day bank and boat fishing tickets available. Tuition and guide service available. Raygill Fishing Lakes fly fishing for brown, blue, rainbow & golden trout on two well stocked lakes. Two picturesque coarse lakes are stocked with roach, bream, carp, tench, chub, orfe, perch, crucian carp, rudd & gudgeon. Kilnsey Park Kilnsey Park Fly Fishery is situated in spectacular surroundings. The two spring fed lakes are both approximately 1 acre in size and are open all year round, fishing well throughout the winter. The lakes are well stocked with hard fighting Rainbow, Blue, Brown and Golden trout from 2lb to 20lb+, all from our own Trout Farm.